This is the text of my piece on Owls which featured on Sunday Miscellany on 30th October 2011. You can listen to the podcast here. I am first up just a minute or so in. Standing on a hill in deepest Wicklow, a north easterly wind whipping my hair into an unruly nest, I tried to run through in my head what the Falconer had told us on the safety briefing. My fellow participants on this Introduction to Falconry day were spread out in a wide arc around me. High up, in the swaying trees behind us, watching our preparations, were two Harris Hawks. A crimson morsel of raw meat was pressed onto the top of my closed fist. I extended my arm out and as I half turned towards the trees, the falconer blew his whistle. There was the incongruous faint tinkle of bells and the hawk swooped down from the tree and expertly brought herself in for a landing on my glove. My breath caught in my throat and I could feel adrenelin pulsing through my veins. The meat was swallowed in a second and then this magnificent bird turned its head and stared me straight in the eye. I couldn’t remember what our falconer had said – it was either never look a bird of prey in the eye or do look them straight in the eye. Apparently their eyes don’t move. So our eye movements either annoy them or calm then. I couldn’t remember which. It didn’t matter anyway, because I was mesmerised. Completely transfixed by the stare of the hawk. This majesterial bird, a wild animal to its very core, fully capable of inflicting serious damage should it so choose, seemed to be calmly looking into the very depths of my soul. Without warning, she took flight again, swooping through the air, on to her next piece of meat. I watched her elegant flight until it was my turn once more. Raw flesh, a jingle of bells, a rush of air through feathers and those huge talons are set firmly on my gloved hand. Again, we stared into each other’s eyes and I carefully raised my right hand to stroke this bird on her back. Whoosh and she was gone. The Hawk Walk was thrilling, moving and deeply satisfying. There is a standing joke in our house that gets played every time I am asked what I want for Christmas or my birthday. “I want an owl,” I say and my children groan, at my rubbish attempt at being funny. But I am serious. I am deeply drawn to owls. Up till now I have only ever seen an owl in a zoo. I have long wanted desperately to get close to one without a barrier between us. The first owl our Falconer introduced to us was a kind of miniature model, from Chile. A daytime hunter, this owl eats insects and such like. 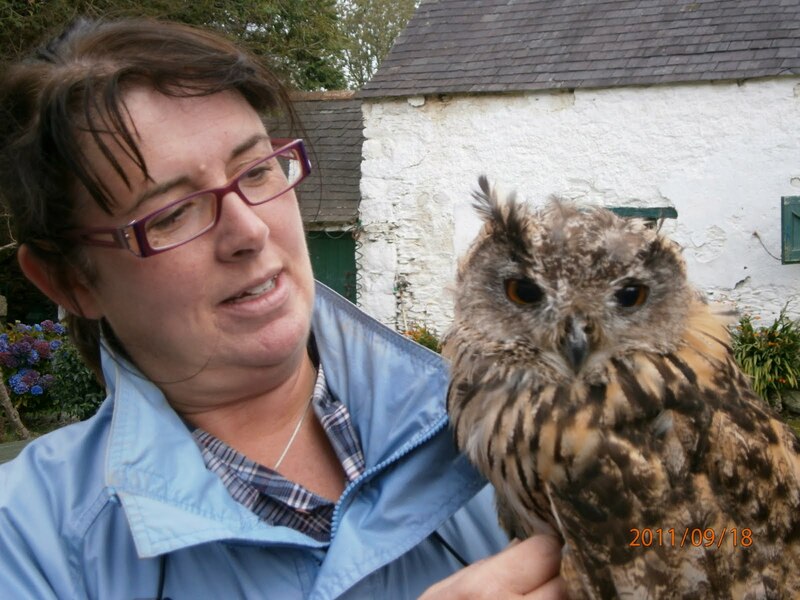 In the windy environs of Wicklow and with the air full of swallows, our little owl was a tad nervous. Her head rotated around and turned fully to stare upwards at the sky in comedic fashion. Next up was what I would have called a normal sized owl. She flew to my bare hand for some raw meat and then continued to peck at my skin very gently. She was happy to be stroked and I smiled gormlessly at the joy of it all. The more the falconer explained about this bird, the more I realised I had met a kindred spirit. In my mind I could see this big ole owl and me, perched on the sofa at home, watching The Late Late Show (what else would an owl watch) and munching on some nuts or chocolate, maybe having a glass of wine. This was a wise old owl, albeit a somewhat overweight and out of condition one. I stroked her feathers which were soft and downy. She turned to look at me and we connected. Here was an owl with miles on the clock, with years of experience, who had no doubt seen things no owl should see. She wore her years on the outside. But on the inside she was a majestic bird, a hunter and thinker of deep thoughts. We gazed at each other and our thoughts fused in the space between us. Yes, she said I am Owl. I can see the unseen. I can know the future. I can read the moon. Yes I said, I am woman. I too can read the moon. I too could know the unknowable except unlike Owl, I have forgotten how. As I reluctantly took my leave, I pondered on the wisdom of owl and what we humans have lost in our pursuit of technology. I am sure that everyone in the ‘writing world’ in this country knows Vanessa O Loughlin and her brilliant website Writing.ie. But one of Vanessa’s very best ideas ever is the ‘Great Writing Great Places’ series which is currently taking place in various venues in Dublin. Run in partnership with Dublin City of Literature each event features writers, speaking on a specific theme and giving readings from their work on the subject. The first of the series was Tales of Emigration which took place on board the famine ship, Jeannie Johnson on the Liffey. Last night I attended the second of the series, entitled Inspiring Lives. This event took place in the Deanery of St Patricks Cathedral and was chaired by journalist, writer and musician Dave Kenny who interviewed writers Brian Keenan and John Lonergan. 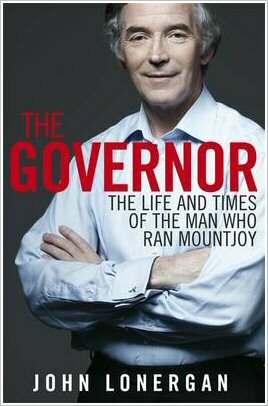 It was a masterstroke to bring these two remarkable men together on one ‘stage’ – the former prisoner who was held captive for over 4 years in Beirut and the former Governor of Mountjoy Jail. They both had inspirational tales to tell. But for me, John Lonergan was the star to the show. Lonergan is a man with a ready smile and an open gentle face who spend over 40 years working with some of the most dispossessed, hardened and troublesome people in the country’s jails. As Governor of Mountjoy he single-handedly brought prison life out of the shadows and into our consciousness with his regular interviews and media appearances. As I sat and listened to him speak with passion and compassion last night I was moved to near tears. “Our jails are full of broken people,” he said “sure there are the hardened, well known criminals, but the majority of the prison population are broken. They are those with mental health issues, addiction issues, and the severely socially disadvantaged.” He told us of watching whole families who repeatedly go through the prison. He spoke particularly eloquently of the women who spend years visiting their loved ones inside – the wives, sisters, girlfriends and especially the grandmothers. These matriarchs, who have often lost a son or daughter to drug addiction and are now visiting their grandchildren in prison while rearing other grandchildren. He said that unless you have visited someone you love in prison, you really have no idea what prison is about. He is right. John Lonergan is a man of humanity, empathy, kindness and above all great positivity. I watched him carefully as he told us his stories of life within the prison service, of how he wanted to change the system. 40 years later, he admits that little has changed. He told us this without a trace of bitterness or rancour. He knows that he may have made a difference to the lives of those who were in his care during his long tenure in the country’s most infamous jail. And for him that counts. Counts deeply. I was very moved by his contribution last night. When I came home, I learned of the impending death of Troy Davis, a man on death row in Georgia, USA. Many were calling on the US to halt the execution, including Amnesty International who felt that his conviction was very unsafe. I woke this morning to the news that Davis had indeed been executed. America’s continued use of the death penalty and the Davis case in particular provides a stark contrast to John Lonergan’s words of courage, empathy, humanity, kindness and positivity. These are special attributes, to be highly prized. We are so lucky to have had a man such as Lonergan working within our prison service for so long. He might not have ultimately brought change to the system.. but last night his words touched me deeply. Here was a man whose values match entirely those that Ireland should present to the world. No Presidential candidate or possible candidate comes close to embodying them like Lonergan. What a wasted opportunity. “a big hairy spider has just crawled under the chest of drawers,” I said in my best damsel in distress voice. “shut up and go back to sleep” was the response and the snoring resumed. So I did what I normally do when my husband won’t engage with me, I grabbed my phone and sought sympathy and reassurance from Twitter. The response was not entirely as I would have liked. I did get some kindness and understanding. Some helpfully advised me to just relax as spiders are not really into engaging with us humans. Others thought it appropriate it send me photos of huge hairy spiders and shared with me tales of spiders making nests and spawning thousands of new spiders in the night Time! Spiders are my least favourite creepy crawly. I think it is because I usually can’t tell which way they are facing and because of the way they move – suddenly and erratically. But we do live with them, especially at this time of year when they move indoors and up plugholes to sit in our baths. What did our ancestors think about spiders? What nuggets of spider wisdom can be found in folklore? Most people know that spiders are linked with money. Apparently if a spider crosses your palm you will receive a windfall. The larger the spider and the later in the day your encounter, the more money that is on your way. On that basis I should be winning the Lottery this weekend. Killing spiders is often seen as bad luck. You will be told you will lose money, your house will never be clean and in our family we believed it would cause it to rain. Squishy squashy, that’s too bad. In Native American folklore Grandmother Spider was credited with bringing light to the world. The story goes that in the early times, all was dark because the sun was on the other side of the world. The animals decided that people needed to see so they set about bringing the sun back. The Possum and the Buzzard both tried and failed. Finally Grandmother Spider said that she would go and fetch the light back. Using her legs she made a bowl of clay. She rolled this bowl across the world, weaving a web as she went. She found the sun and carefully placed it in the bowl and then following her web she returned, spreading light all the way. There now – doesn’t that story change the way you think about spiders? Next time you meet one, remember she is Grandmother Spider who brought the light to the world. However an old Wiccan piece of folklore suggested that if a witch eats a spider sandwiched between two pieces of bread, her powers will be increased dramatically. Ha – I’ve gone and spoiled it all now, haven’t I! It was a cold Monday morning, the 3rd of December 1979 when I arrived at 8/11 Lower Baggot Street, Dublin for my first day at my first ever real job. I clumped up the stairs in my brand new tan cowboy boots to the 3rd floor where I was asked to take a seat in the cramped reception area. As I sat down the tiny bells attached to my new peasant dress made a little tinkling sound. Within a few minutes I was joined by another new recruit. This girl had clearly read up on how to dress for your first day at work. Attired in a neat and conservative suit, she carried a proper handbag and removed her gloves to elegantly introduce herself. So there we were – the hippy from Dun Laoghaire and the elegant old school country girl – about to join the JWT set. If there was the sound of muffled giggling at the sight we must have presented, in our excitement we never heard it. One of the very first things we were told on that baffling day was that on Friday we would be decamping with the rest of the company for a weekend in Kenmare for the annual JWT Staff Conference. “Saturday is Gala Night, a chance to really dress up” the sales manager announced, his eyes firmly fixed in my direction. 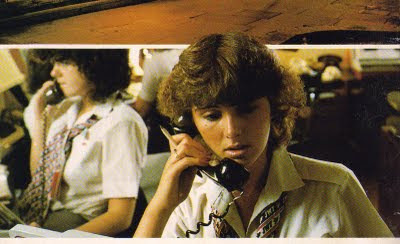 That first week passed in a blur of introductions, tours of the sales offices, being fitted for a uniform and the beginning of our training in the art of selling holidays. It ended in Kenmare where myself and the other new girl disgraced ourselves by sleeping it out on the last day thereby delaying the coaches to Killarney and nearly causing the entire company to miss the train to Dublin. We arrived back having learned more in that one weekend that certainly I had in the previous 17 years and with sore throats and no voices. JWT was founded in 1961 by Joe Walsh, a tough straight talking Northerner who began by first operating pilgrimages to Lourdes. As we rolled into the 80s, JWT was Ireland’s leading tour operator offering holidays to a wide range of resorts in Spain, Greece, Portugal and Italy. The company operated the first computerised holiday reservation system in Ireland (and possibly the UK) and had some very cool TV ads. It was a young company – most of the management would have been in their early 30s at most. Joe Walsh for all his rather terrifying persona and the fact that he had no time for Trade Unions, believed very much in keeping staff morale high. He achieved this not by paying us bonuses or top wages, but by laying on plenty of entertainment and social events – and this remember was in the days before corporate ‘team building’ or ‘away days’. There were mid season parties, Christmas parties, the aforementioned conference and departmental get togethers. And then there were the weekends in perhaps Majorca or Gran Canaria – sometimes disguised as ‘educational trips’ and sometimes just because we had free seats going out and perhaps a ‘light leg’ or empty aircraft coming home. Oh, the heady fun of it all. Joining the JWT set was not for the faint hearted. After a year or so on the sales counters, mainly in the office on Grafton Street, I moved up to Head Office to work in Reservations. Here, along with 9 other colleagues we manned a bank of phone lines and dealt with queries from both the public and travel agents. As Ireland sank into a recession, the reservations department took on the guise of an African Souk with much wheeling and dealing to “get bums on seats” for that weekend’s departures. From October till Christmas, the business was dead and the office quiet with many staff taking advantage of ‘winter leave’ when good ole Joe encouraged us to head off to foreign shores on some unpaid leave, but in the confidence that our jobs would be waiting for us on our return in January. The new season’s brochure was always launched just prior to Christmas and the first airing of the new TV ad was generally on St Stephen’s Day. We hit the phones full pelt in January and so the years turned and rolled on, one into another. They were happy and very carefree years where friendships were made, some of which have survived and thrived to the present day. Some faded in and out over the years and some vanished without trace. This year JWT celebrates its 50th anniversary. To mark the occasion there is a staff reunion on the 30th of September. A chance to renew some old friendships, share stories and laugh at ancient memories. Like the dreaded school reunion, there is an element of fear that time will not have been as kind to me as to others. But I am burying that fear deep within my psyche and from the same depths I am retrieving my younger self. It will be her that I will bring to this auspicious event. She may even wear a new hippie dress with bells on. I just hope my former colleagues recognise her! The wind is howling outside, whistling down the chimney and slightly unsettling the dog as he slumbers on the rug in front of the roaring fire. The girls are in bed and I am reading. The scent of my recently brewed coffee mixes with the fragrant smell of turf on the fire. Fatcat is sitting on the windowsill staring into the velvety blackness of the night. Does he see the canopy of stars overhead? The photographer is back in Dublin but will be joining us tomorrow for the weekend. The school bags and wellingtons are by the door, ready for the walk to school in the morning. I close the curtains to retain the heat before placing the guard in front of the fire and retiring to bed. As I lie in the bed the silence is thick, broken only by the faint roar of the waves in the distance. It’s 11pm. 11am next day and the sky is blue with puffs of cotton wool clouds scuttling across its huge expanse. I am at the table by the window, laptop open, my novel coming to life as my fingers dance across the keys. The dog is outside, exploring the landscape which is as yet not fully familiar to him. Through the window I can see the ocean and the coastline of Connemara. The ferry should be arriving about now down at the pier. In a couple of hours I will visit the local shop and purchase something for dinner tonight. The photographer will arrive by air late this afternoon. Its two weeks since he last visited and he will be staggered to hear how much Irish the girls have now learned. 3pm and the girls arrive home. I leave them to their homework and cycle down to the village shop. Dylan comes too – jogging along the road beside me. On the way I greet my neighbours as Gaeilge and stop for a chat with the teacher who is closing the school. She compliments me on my weekly column for the Irish Times. She says I am being very honest about my year of living on Inis Meain. I haven’t worn make up all week and I probably should check that my hair dryer still works at some stage. It starts to rain... sideways. I am soaked by the time I arrive back home but invigorated by the energetic weather here. 10pm and we are once again gathered around the fire chatting about Christmas. For the first time in years we won’t see any family during the holidays but we are happy to embrace all aspects of this experimental year on the Aran Islands. Outside the wind is throwing handfuls of rain against the windows. The photographer has brought a lovely bottle of wine. We miss our Friday night take out... but all is well. All of the above takes place in my head. I visit these scenes when I am out walking, in the bath or sometimes sitting in my car waiting for the girls to come out of school. 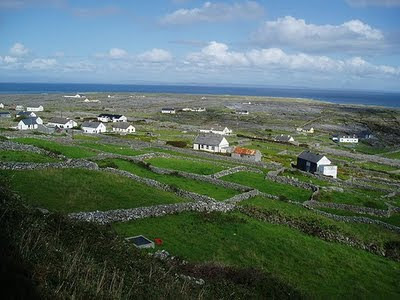 There is something special in the air on the Aran Islands. Something which speaks to my soul, my very essence. It calls to me... faintly. I hear it and I dream of some day answering the siren call from the very edge of Europe. In the meantime I dream.... and sometimes just that is good enough.